The Army's Class A uniform is the main service dress for soldiers not currently engaged in combat or utility activities. The United States Army's Class A uniform is the basic service dress that soldiers wear on a day-to-day basis when not engaged in combat or other utility activities. 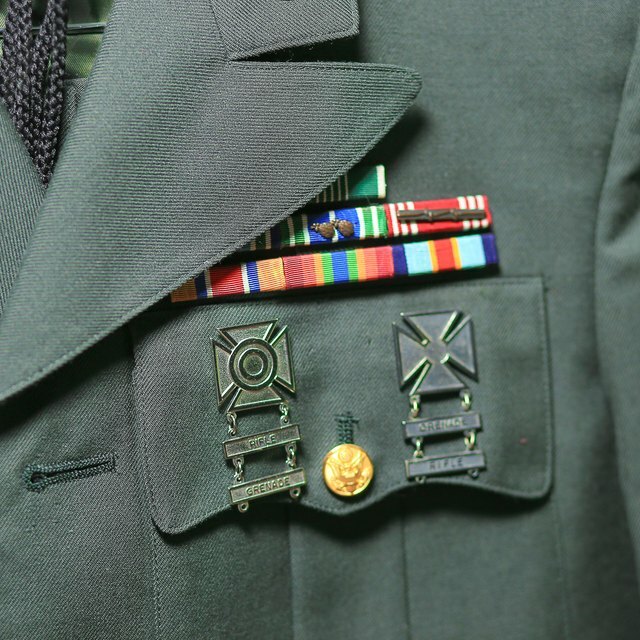 Due to the fact that the Army maintains strict uniform regulations, great care should be taken to assemble the uniform as specifically as possible before wearing it. Note: The Army currently has two wearable Class A uniforms: blue and green. While both are viable options, the green uniform will be phased out near the end of fiscal year 2014 in favor of the blue uniform. Note that steps for the green uniform will remain basically the same outside of the color of the uniform items. Put on underwear, black socks and a plain white T-shirt. While these are not necessary items for the Class A uniform, it is highly recommend you wear all of these for reasons of both comfort and hygiene. Step into trousers and pull them up to the natural waistline. The pants should fit so that they fall between the top of the heel and the top of the shoe. 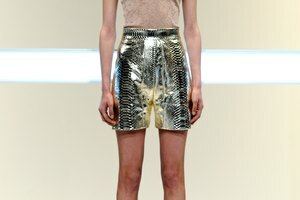 Skirts, meanwhile, should also fit at the natural waistline and be between one and two inches below the center of the knee. Put on and tie shoes. Shoes should be black leather, oxford style with three eyelets and neatly polished. Females, meanwhile, can wear low quarters of the same style with a heel of no more than two inches or black leather pumps with a heel between one-half inch and three inches. Put on white long- or short-sleeve shirt and tuck it into the trousers. The sleeves of the long-sleeve shirt should extend to the center of the wrist bone. Fasten the pants with the belt so that the tipped end slides into the metal buckle and no fabric can be seen. Fasten black necktie, or for females, neck tab. The tie should not be more than two inches above the belt or longer than the belt buckle. The neck tab, meanwhile, should only be worn with a long-sleeve shirt. Put on the Class A jacket. For men, the jacket should extend to an inch below the crotch and be form fitting with no excessive looseness or flaring. Sleeves should be one inch above the wrist. Women are subject to the same regulation, except that jackets should extend down to the hips. Put on the beret. The headband across the front must be level and even with the forehead. 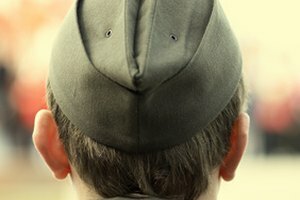 The excess fabric on the beret should drape over the right ear and extend down to the top of the ear. The Class A uniform will be exclusively blue starting in 2014. 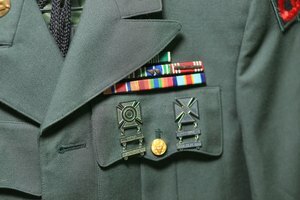 The green Class A uniform will no longer be acceptable. What Would Be a Good Outfit to Wear to the Office? Moore, Marshall. "How to Put the Army Class A Uniform Together." Synonym, https://classroom.synonym.com/how-to-put-the-army-class-a-uniform-together-13583497.html. 04 October 2017.